Throughout eastern North America, a patch of bloodroot blooming on a woodland hillside is one of the cherished early signs of spring. Bloodroot is an herbaceous perennial that grows from a persistent, branched underground stem or rhizome. Early each spring, while the forest canopy is still bare, each well-developed rhizome tip produces one leaf and one flower stalk. The leaf is kidney-shaped in its overall outline, but it is also divided into a pattern of rounded lobes and sinuses, rendering a complex overall shape. 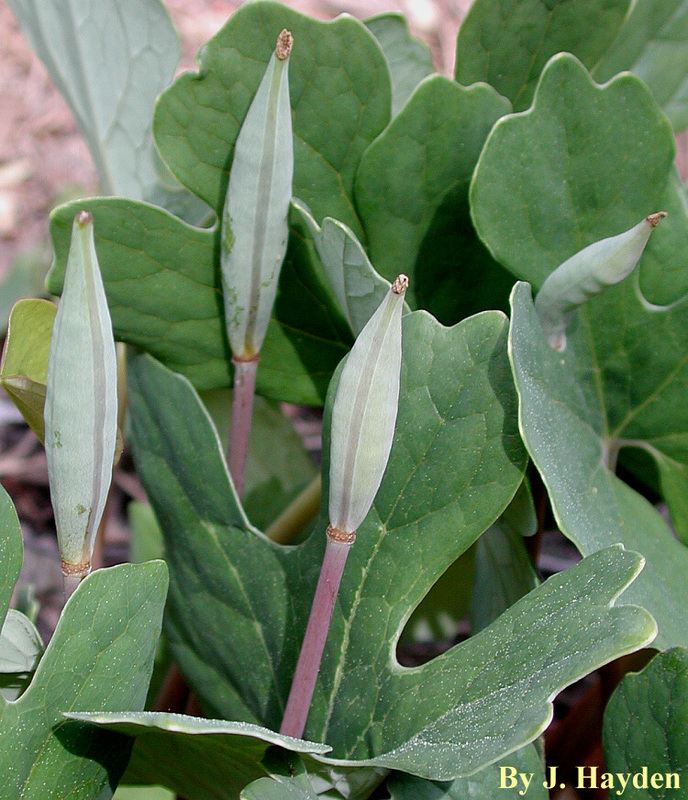 At flowering time, bloodroot leaves form a loose vertically-oriented collar around the flower stalk with the bluish-green lower leaf surface forming the outside of the collar; as the season progresses, the leaves open flat and expand to their full size, which commonly ranges from six to eight inches across, and held about a foot above the ground, but leaves can become larger in favorable locations. The flower buds are enclosed by a pair of sepals that promptly fall away as the flower opens. Petals are white or pale pink, relatively narrow, and variable in number from 8 to 16 or so. The bright yellow stamens number from 12 to 24. At the center of the flower there is a single greenish simple pistil with a short style and bi-lobed stigma. Inside the ovary, two rows of ovules are attached along the suture line of the carpel margins. The ovary forms a tapered cylindrical follicular fruit that opens while still more or less pale green or with just a hint of yellowing. The seeds are black or dark reddish brown, and fitted with an oil-rich appendage known as an elaiosome. Linnaeus gave bloodroot its scientific name, Sanguinaria canadensis. The genus name is based on sanguinarius(Latin, bleeding), a reference to the reddish latex found in the rhizome, petiole and flower stalk and the species name means “from Canada.” Bloodroot is classified in the poppy family, Papaveraceae. Thus, it is related to the celandine or wood poppy (Stylophorum diphyllum), as well as the various species of poppy frequently cultivated in gardens and the notorious opium poppy, Papaver somniferum. Like other members of the poppy family, bloodroot contains alkaloid molecules that are responsible for both toxic and therapeutic effects. Thus, the plant can be considered both poisonous and medicinal. There is a long tradition of use in folk medicine and bloodroot extracts can be found as an ingredient in over-the-counter oral hygiene products. Pharmacological studies demonstrate antibacterial and antitumor activities, but the same constituents also have deleterious effects on fundamental metabolic processes of human cells. Despite folk tradition, ingestion of bloodroot products cannot be recommended. The red pigments contained in the latex can be used to dye fabrics or craft items like baskets. 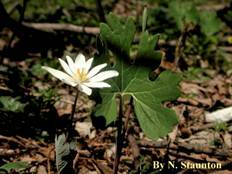 Bloodroot grows in the shade of deciduous trees. It prefers rich sandy soils, but can tolerate clay if the site is well-drained. Bloodroot ranges throughout the eastern deciduous forest region, from southern Canada to the Gulf coast and westward to the Great Plains. Flowering dates vary from year to year. Throughout much of Virginia, flowers can be expected sometime in March, or somewhat later at higher elevations. Ants gather the seeds for the food value of the elaiosome and, in doing so, they disperse seeds away from parent plants. 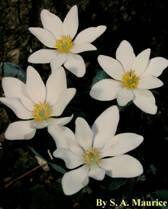 Bloodroot adapts well to cultivation. Garden conditions that mimic its natural woodland habitat are best. Thus, a site under deciduous trees will provide sunlight in late winter to early spring and shade in the summer. Moderately rich soil and good drainage are recommended. In overly moist soils, the rhizomes are subject to decay. Bloodroot grows well from seeds provided that they are planted promptly, as soon as the fruits open. If the elaiosome is allowed to dry while still attached to the seeds, germination is severely inhibited. Also, seedlings from ant-dispersed seeds will be common around established garden specimens. Large plants can also be propagated by division of the rhizome when the plant is dormant, i.e., fall or very early spring. Bloodroot is frequently available in the commercial nursery trade, but to preserve wild populations, responsible gardeners should insist on purchasing only nursery-propagated specimens. There is a large-flowered variety, S. canadensis var. grandiflora and forms with “double” flowers are known horticulturally as cv ‘Multiplex’ or ‘Flore-pleno.’ The showy large-flowered and double forms are preferred by some in garden settings. Although bloodroot flowers are short-lived, its bold leaves provide a distinctive textural feature in the woodland garden. Mulching will help to conserve foliage during summer. 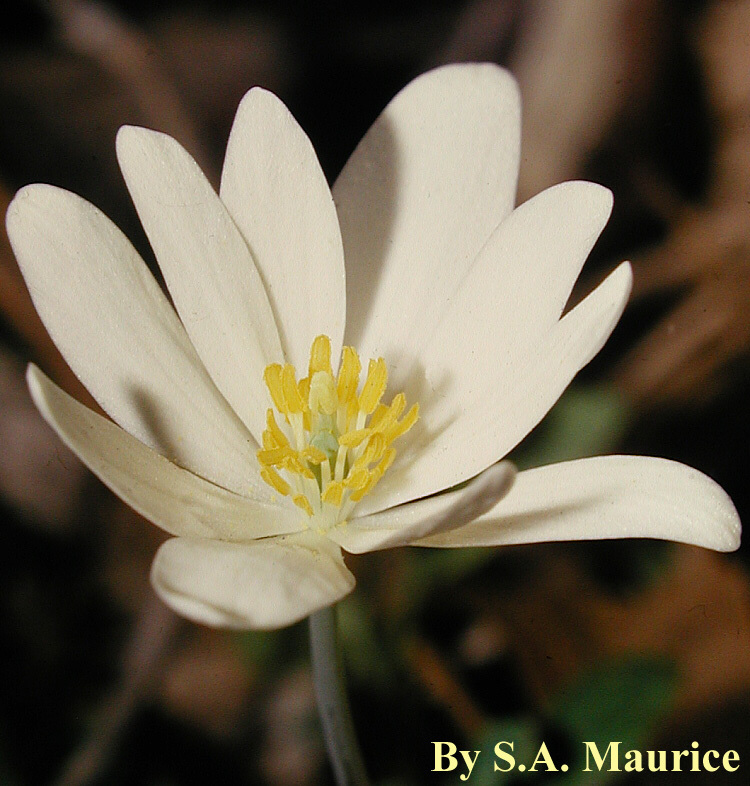 Bloodroot grows in deciduous woodlands throughout Virginia. Beyond the Old Dominion, bloodroot can be found from southern Canada to the Gulf Coast and westward to the limits of deciduous forest in the central plains. It is also well-represented in public and private woodland gardens throughout eastern North America. The main threats to this common native species are habitat destruction and collection of wild plants for horticulture or medicinal use. Text from 2005 Virginia Wildflower of the Year brochure, written by W. John Hayden and adapted by him for the Web, December 30 2004.